Recent trends in FDI and TNC activities illustrate the deep and ongoing changes occurring in the world economy. 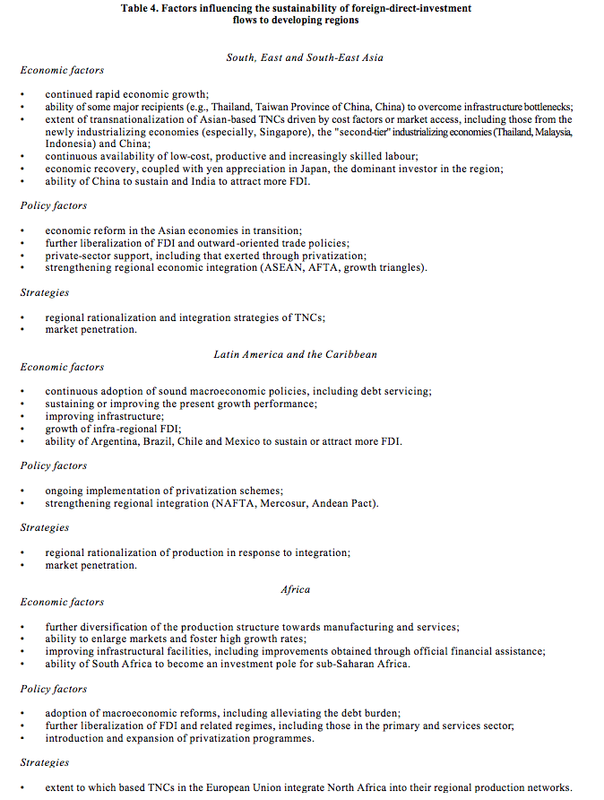 The broad picture that emerges is characterized by the recovery from the FDI recession, the outstanding – although uneven – performance of host developing countries, the growth in the number and reach of TNCs and the changing character of the world economy on account of the integration brought about by TNCs at the level of production. After a two-year slow-down in outflows (from $232 billion in 1990 to $171 billion in 1992), FDI outflows began recovering in 1993, reaching $195 billion (table 1). Not all major home countries contributed equally to the recovery. Still, the recovery from the FDI recession is seeing a slow return to the previous configuration of major home and host countries. This configuration had substantially changed during the FDI recession: Japan slipped from first place as a source of FDI to third place, behind the United States and France (table 2). The United Kingdom – the largest outward investor during most of the second half of the 1980s moved down to fifth place, after Germany. The decline of world FDI outflows during 1991 and 1992 consisted primarily of reduced outflows from Japan and, to a lesser extent, from some Western European countries, mainly to the United States. The large decline in Japanese outflows – accounting for 44 per cent and 65 per cent, respectively, of the total declines during these two years – can be explained by a combination of adverse cyclical factors and some special factors. Among the latter, particularly noteworthy are the weakened financial position of many Japanese TNCs resulting from plummeting stock prices at home, compounded by under performing investments in Europe and the United States undertaken during the investment boom of the late 1980s. The decline of FDI outflows from Western Europe was not as large as that of Japanese outflows, primarily because the differential timing of the economic recession across Europe partly mitigated the overall decline of FDI flows. In addition, the implementation of the Single Market programme continued to create intraregional opportunities for FDI by European and other TNCs. In comparison with both Japan and Western Europe, United States FDI outflows remained at a high level during the recession and increased substantially in 1993. This reflected the more diversified geographical profile of the country’s outward FDI, which permitted United States TNCs to exploit FDI opportunities in some regions and countries, in spite of the recession. On the inward investment side, the economic recession saw a collapse of investment flows to the United States – the largest host country during the 1980s and early 1990s – to 2 per cent of world inflows in 1992 (compared to over one-third in 1989). In absolute values, inflows declined from $69 billion in 1989, the peak year, to $3.4 billion in 1992. The decline of cross-border mergers and acquisitions, which play an important role in the market-entry strategies of TNCs, was substantially responsible for the fall in FDI flows into the United States and major countries in Western Europe. With the recovery from the FDI recession, the earlier pattern of major host and home countries is beginning to re-emerge. On the inflow side, the United States has resumed its position as the largest host country, with its inflows reaching almost $32 billion in 1993. On the outflow side, the United States has strengthened its position as the largest source of FDI, investing abroad a record $50 billion. The United Kingdom regained its position as the largest home country in the European Union, lost during the FDI recession to France. The developing countries, too, contributed to the recovery of outflows. Outflows from Germany and Japan have not yet started to recover, but they stopped decreasing, signalling, perhaps, that they have reached the bottom of the cycle. Approval data for Japanese outflows for fiscal year 1993/1994, in particular, augur well. Even during the FDI recession in the developed countries, flows into developing countries continued to boom, one of the outstanding features of recent global FDI trends. In 1993, developing countries attracted a record $80 billion in estimated FDI, twice the amount of flows in 1991 and the same as the level of total world inflows in 1986. As a result, the share of developing countries in world FDI flows reached about 40 per cent in 1993, a share unsurpassed in decades. Foreign-direct-investment flows in 1992 were the largest component of net resource flows to developing countries, comprising one-third of the total; they constitute over one-half of total private flows to those countries. The most important factors making developing countries attractive to foreign investors were rapid economic growth, privatization programmes open to foreign investors and the liberalization of the FDI regulatory framework. However, the growth of FDI flows to developing countries is unevenly distributed among regions and groups of developing countries. Most FDI inflows are still concentrated in 10 to 15 host countries overwhelmingly in Asia and Latin America (figure 1) . China has become the largest host country in the developing world, accounting for nearly three-quarters of the increase in FDI flows into developing countries in 1992 and over half of the estimated increase in 1993. Indeed, with $26 billion inflows, China has become the second largest host country in the world in 1993, after the United States, with important consequences for its external trade: the share of foreign affiliates in the country’s exports increased from 9 per cent in 1989 to over one-quarter in 1993, while the total volume of exports increased from $53 billion to $92 billion. 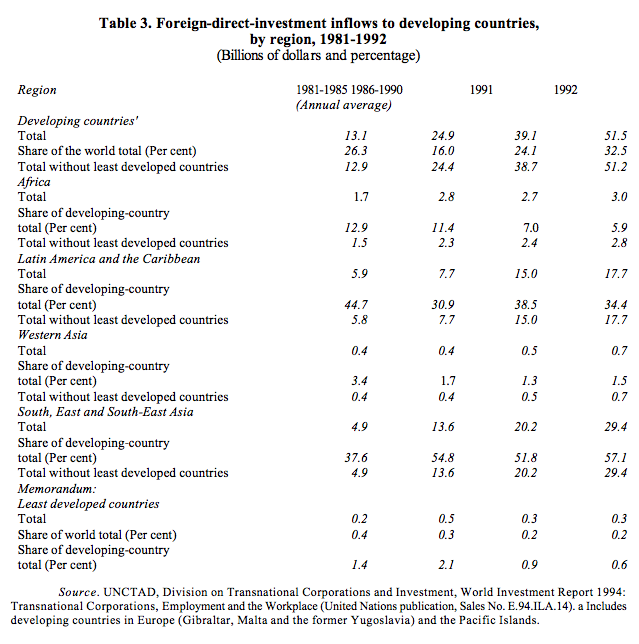 On the other hand, the least developed countries as a group have received little FDI (table 3). Indeed, their share of total developing-country inflows declined from an annual average of 2.1 per cent in 1986-1990 to 0.6 per cent in 1992. In absolute value, the $300 million received by them in 1992 was less than the inflow received by individual developing countries, e.g., Pakistan, in that year. This unevenness is also reflected in the regional pattern of FDI. Most of the increase of FDI flows has been concentrated in East and South-East Asia, as well as in Latin America and the Caribbean. Flows to Africa – which includes the largest concentration of least developed countries – did not increase between the second half of the 1980s and the early 1990s; as a result, the share of Africa in developing-country inflows was halved to 6 per cent between these two periods. South, East and South-East Asia have been experiencing the fastest economic growth in the world, and remain the largest host region, accounting for 57 per cent of total developing-country FDI in 1992. China’s performance has been central in this respect. Flows into the newly industrializing economies slowed down, however, as a consequence of the restructuring of FDI in response to the loss of some locational advantages and to their efforts to become attractive to high technology or skill-intensive investments. These economies continue to be significant outward investors and are moving labour-intensive activities to other countries in Asia. As a result, intraregional FDI is growing; countries such as China, Indonesia, Malaysia, Thailand and, increasingly, Viet Nam are particularly attractive locations for such investment. Prospects are quite promising that this region will be able to sustain the present level of FDI inflows, if not improve on it, given that most principal factors determining FDI flows are favourable (table 4). Even if FDI flows into China should slow down, as latest signs suggest, there are still a number of markets in the region – most notably India – that have yet to be fully tapped by foreign investors. Average investment flows into Latin America and the Caribbean during the early 1990s were more than twice as high as those during the 1980s. This revival of inflows reflects the recovery of economic growth, market-oriented reforms and a liberalized FDI framework. While FDI through TNC participation in privatization and debt-equity conversion programmes is still important in some countries, others, such as Chile and Mexico, are now succeeding in attracting substantial amounts of investment outside such programmes. Prospects for sustaining the present growth of FDI flows appear to be quite favourable. Progress towards greater economic integration, both within this region and with North America, would be an additional factor generating and attracting FDI. 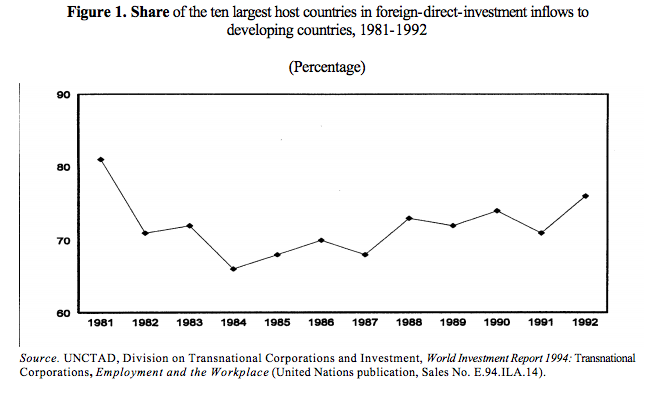 Despite the widespread liberalization of FDI policies by many governments in Africa during the 1980s, FDI inflows did not increase between the second half of the 1980s and the early 1990s. Averaging around $3 billion a year, FDI flows to the entire region are considerably less than those received by, for example, Malaysia in the early 1990s. Small markets with low growth rates, poor infrastructure, high indebtedness, slow progress in introducing market- and private-sector-oriented economic reforms and low levels of technological capabilities all reduce the attractiveness of many African countries to foreign investors. Inflows are concentrated in oil exporting countries, especially Egypt and Nigeria. However, a number of small African countries, such as the Seychelles and Equatorial Guinea, have attracted considerable FDI inflows in relation to the size of their economies. That suggests that a differential analysis is required when assessing the investment potential of African countries. Still, although some countries are clearly more successful in attracting FDI than others, prospects for FDI in Africa as a whole and especially in sub-Saharan Africa are not so favourable. External assistance, particularly official development assistance, will therefore continue to be of great importance to create the premises for self-sustained growth, including an FDI-friendly environment . … but only moderate FDI increases in Central and Eastern Europe. The remarkable expansion of FDI flows to developing countries has belied the fear that the opening of Central and Eastern Europe – and the efforts of the countries of that region to attract such investment-would divert investment flows from developing countries. In fact, the growth of FDI flows to Central and Eastern Europe has fallen far short of the growth of flows to the developing countries. The modest inflows also greatly dampened expectations regarding the role of FDI in the transition from centrally planned to market economies. Flows into the region totalled an estimated $5 billion in 1993 (about the size of flows to Mexico). 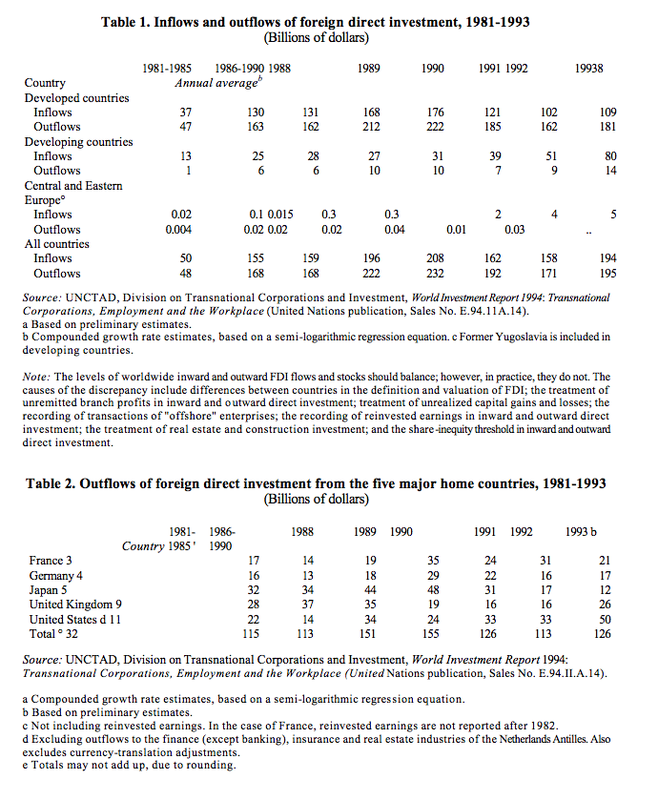 Cumulated FDI flows were approximately $13 billion in 1993 (barely more than the FDI stock in Thailand). Investments are unevenly distributed within the region, concentrated in those countries that have made the most progress in establishing a market-oriented economic system. Nevertheless, FDI in some key industries (such as automobiles), the establishment of new linkages with Western Europe, the transfer of modern technology and management practices to foreign affiliates and supplier firms and the provision of previously unavailable services assist in speeding the transition and fostering economic recovery. In addition, TNCs help indirectly in the transition to a market economy by exerting pressures for institution building, privatization and competition. As regards the future, the region has a good potential to attract foreign investors: many countries are middle-income economies with sizeable domestic markets and pent-up consumer demand for goods and services and have a large industrial base; some countries are rich in natural resources and have considerable human resource endowments and relatively low labour costs; and the proximity to the European Union market could entice TNCs to reorganize affiliate networks regionally. Even then, however, it is not likely that the result would be a large-scale transfer of production capacities from developed countries to those of Central and Eastern Europe. Rather, what is more likely is an incremental increase in production located there, partly to satisfy local markets, partly as a result of regionally integrated production. The universe of TNCs in the early 1990s was composed of at least 37,000 parent firms that controlled over 200,000 foreign affiliates worldwide, not counting numerous non-equity links. Two-thirds of these parent firms – 26,000 – were from 14 major home developed countries, an increase of 19,000 since the end of the 1960s. 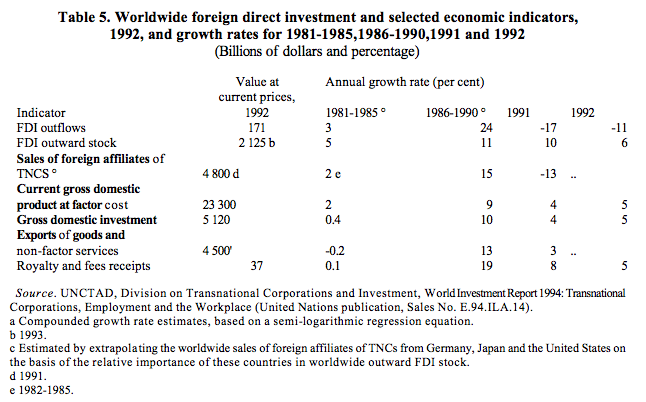 Foreign affiliates generated sales of more than $4.8 trillion in 1991, slightly more than world exports of goods and non-factor services (some one-third of which were infra-firm) and twice the sales figure at the beginning of the 1980s (table 5). The influence of the largest TNCs on output, employment, demand patterns, technology and industrial relations should not be underestimated: the world’s largest 100 TNCs, ranked by foreign assets, held $3.4 trillion in global assets in 1992, of which about 40 per cent were assets located outside their home countries. 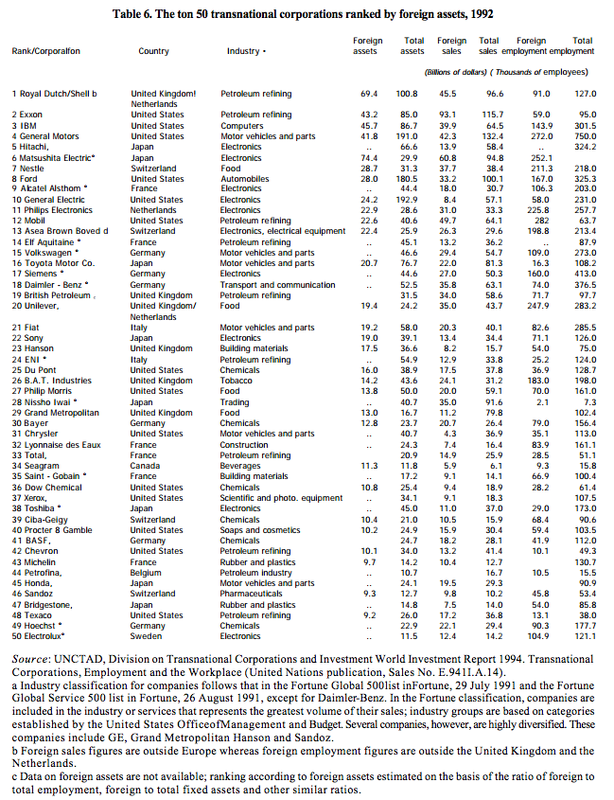 The top 100 control about one-third of the world FDI stock (table 6). … has linked national production systems in the broader context of globalization. Transnational corporations and their activities have not only grown in quantitative terms (table 7) . They also have had a qualitative impact on the world economy, within the broader process of globalization. The driving forces of technological progress and competition, combined with liberalization, have lowered barriers to international flows of goods, services and factors of production, increased the scope for international specialization and led to an unprecedented expansion in international economic transactions. Transnational corporations have played a leading role in this process as traders, investors, disseminators of technology and movers of people – thus strengthening the links among national markets. Beyond that, the distinguishing role of TNCs is that they organize the production process internationally: by placing their affiliates worldwide under common governance systems, they interweave production activities located in different countries, create an international intra-firm division of labour and, in the process, internalize a range of international transactions that otherwise would have taken place in the market. The strategies pursued by TNCs are of central importance to understanding the globalization process (figure 2). The activities of parent firms and affiliates can be linked throughstand alone strategies, in which the links are one-way, concentrating on ownership, finance and technology; simple integration strategies, in which affiliates, in addition, often provide inputs to their parent firms; or the linkages can take place through complex integration strategies, driven by the desire to exploit global economies of scale and a higher degree of functional specialization involving locating specific corporate activities in a number of locations around the world. Although all three strategies co-exist, most recently there has been a shift towards complex integration strategies, a corresponding division of the value chain into discrete functions and their location wherever they can be most effectively carried out in light of the overall needs of a firm. Common governance is reflected in the fact that some one-third of world trade is intra-firm in nature (with its composition shifting towards intermediate goods) and that some 80 per cent of international payments for royalties and fees (as a measure of transfer of technology) are undertaken on an intra-firm basis. Combining the domestic assets of TNCs with the assets of foreign affiliates suggests that as much as one-third of world output is under the common governance of TNCs and hence potentially part of an integrated international production system – the productive core of the globalizing world economy. The recovery from the FD1 recession ... ... is being led by a vigorous expansion of FDI in developing countries ... ... but only moderate FDI increases in Central and Eastern Europe. The expanding 77VC universe ... ... has linked national production systems in the broader context of globalization.